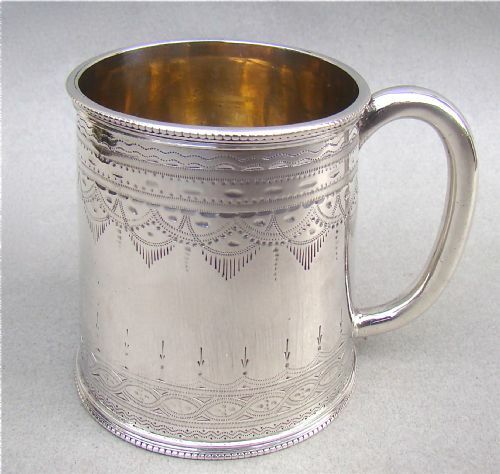 This beautiful and unusual Georgian silver Christening mug is dated London 1824 and bears the marks of George Knight. The baluster body with a fluted lower section and a reeded band on the waisted neck . The pedestal foot and rim with finely executed rope-twist decorations. The elaborate reeded handle with cast acanthus leaf and flower head decorations. It has a very good gauge of silver and feels satisfyingly heavy when handled. Date letter "i" for 1824. Height: 8 cm / 3 inches. Excellent, no dings, no dents, not engraved. 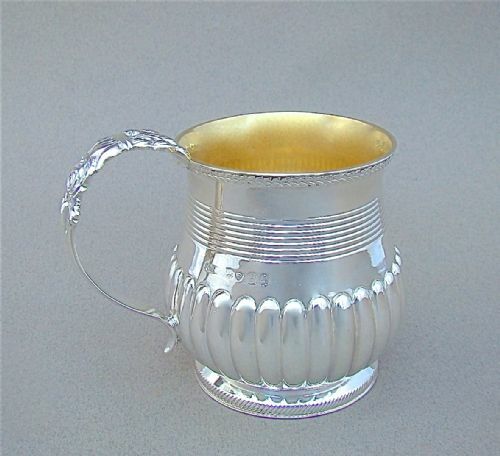 This is a truly delightful Edwardian silver christening mug in wonderful crisp condition. It is hallmarked for London 1906 and bears the marks of Goodfellow & Sons. The cylindrical body engraved with swallows inflight within oval fruiting vine reserves. The front reserve not engraved. C- shape hollow handle and gilt interior. G & Sns for Goodfellow & Sons. Date letter "l" for 1906. Height: 8 cm - 3 2/8 inches. This simple and stylish mug is hallmarked for London 1912 and was made by Pearce & Sons of Bond Street. It has an excellent silver gauge, a testimony of its fine quality. It has a pleasing baluster form and has a distinctive large scroll handle. Its simplicity has a contemporary feel. Date letter "r" for 1881. Height: 9.5 cm / 3.4 inches. Rim diameter: 7.5cm / 3 inches. 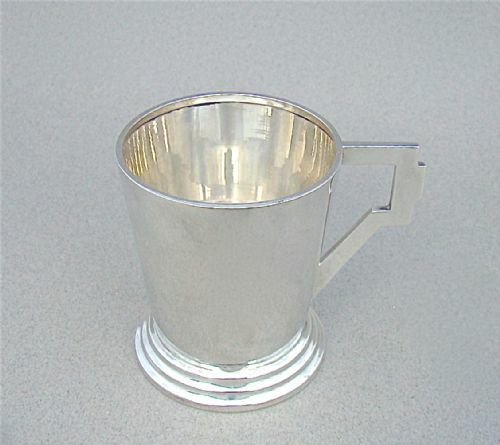 This is a very stylised Art Deco solid silver christening mug . Made by the prolific Sanders & Mackenzie, it is dated Birmingham 1936. The tapered cylindrical body with a distinctive angular handle and a stepped circular base. S & M for Sanders & Mackenzie. Height: 7.5 cm / 3 inches. Rim diameter: 6 cm / 2.4 inches. Base diameter: 6 cm / 2.4 inches. This charming solid silver mounted rattle and teether was made by W H Collins & Co and is dated Birmingham 1914 . 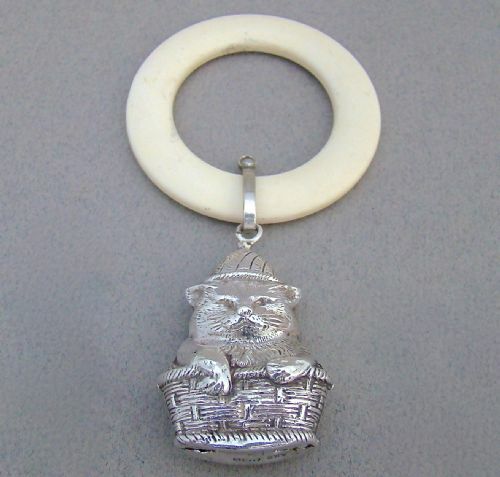 The hollow rattle modelled as a cat with a hat in a basket. The top with an ivorine teething ring. A delightful rattle which would make a lovely christening present. W.H.C for W H Collins & Co. Date letter "p" for 1914. 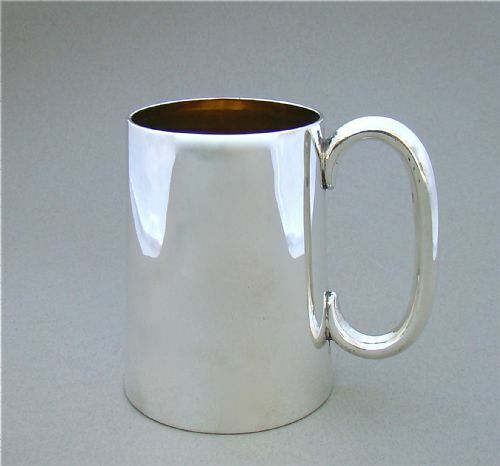 This stunning spot-hammered solid silver christening mug was made by the very collectable A E Jones and is dated Birmingham 1920. The tapered cylindrical body with a spot- hammered silver surface. The angular handle with a distinctive thumb piece, a very typical design of the Arts & Craft period. It has a good silver gauge and feels satisfyingly heavy when picked up. Base diameter: 7cm / 2.6 inches. This exquisite and rather rare silver christening mug was made by the very collectable Amy Sandheim and is dated London 1925. The cylindrical body with a spot- hammered silver surface and a flared rim. The base applied with ball decorations, a very typical design of the Arts & Craft period. Date letter "k" for 1925. The base engraved with "Amy Sandheim" and number 588. Height: 9 cm / 3.4 inches. This is simply a stunning mid-Victorian silver gilt christening mug. Scottish silver is very much in demand and this is a fabulous example.The slightly tapered body finely engraved with geometric patterns. It has a very good silver gauge and feels heavy when picked up. "C" shaped handle and gilt interior. Date letter "T" for 1875. Rim diameter: 6cm / 2.3 inches. 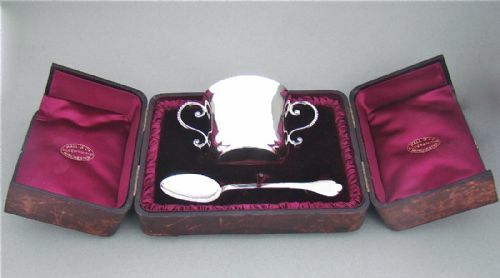 This is a stunning Victorian silver loving cup* with matching trefid spoon made by the renowned silversmith Francis Higgins III. The cup flanked by a pair of beaded scroll handles. The spoon with trefid terminal. It comes in its original Morocco leather case, the interior richly lined with fushia satin and velvet. 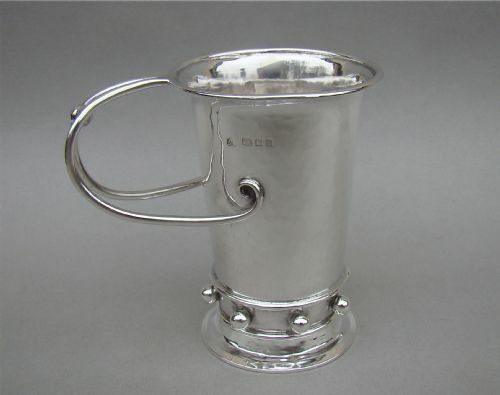 *A loving cup is a shared drinking container traditionally used at weddings and banquets. It usually has two handles. 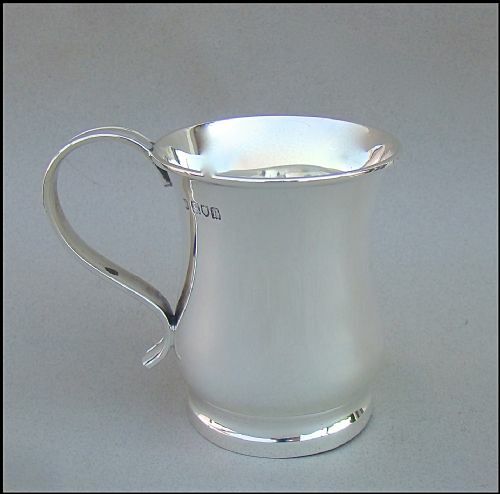 This stunning cup comes with a matching trefid spoon, making it equally suitable for a christening present. FH for Francis Higgins III. Date letter "I" for cup and "H"for spoon , both for 1884. Rim diameter: 8.5cm / 3.3 inches. Length spoons: 15cm / 6 inches. 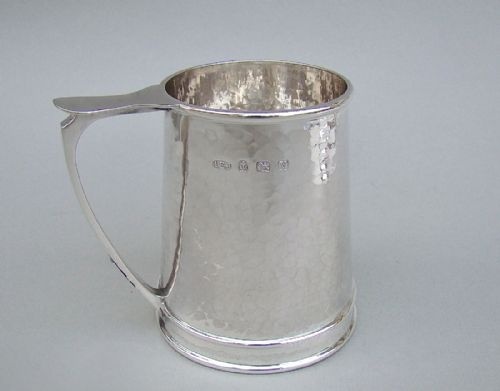 This simple and stylish mug is hallmarked for London 1881 and was made by the reputed silversmiths John Aldwinckle & James Slater. It has a pleasing tapered form and has a distinctive large loop handle that gives it its character. It is between a mug and a tankard due to its large size. Its simplicity has a contemporary feel. JA over JS for John Aldwinckle & James Slater. Date letter "F" for 1881. Height: 11 cm / 4 inches. 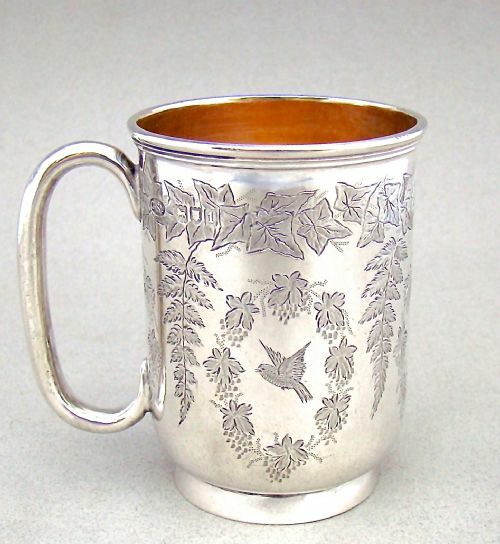 This elegant mug was designed by the renowned Goldsmiths & Silversmiths Company in 1903. It has a pleasing tapered form and has a distinctive large loop handle that gives it its character. It is very rare to find these mugs in their original presentation cases; it makes it all the more desirable and would make a very special christening present. It has a very good gauge and feels solid and substantial. Its simplicity has a contemporary feel and the richness of gilding inside is a testimony to its quality. Rim diameter: 5.5cm / 2.1 inches. 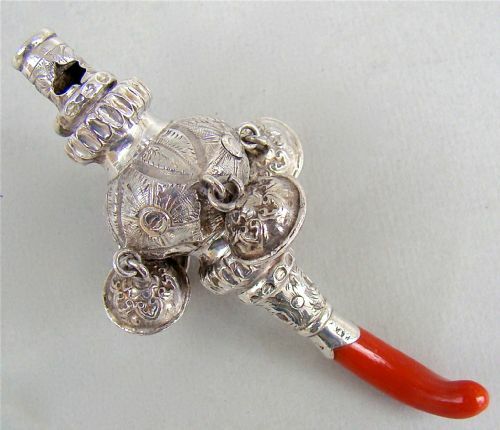 This fabulous solid silver & coral rattle, whistle and teether is fully hallmarked and in wonderful complete condition. 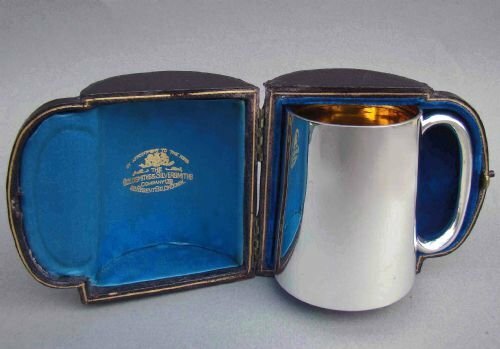 It was made by the sought-after Birmingham silversmiths Hilliard & Thomason and is dated Birmingham 1880. The embossed central part fitted with five bells, the top with a functioning whistle, the teether a beautiful smooth piece of coral.